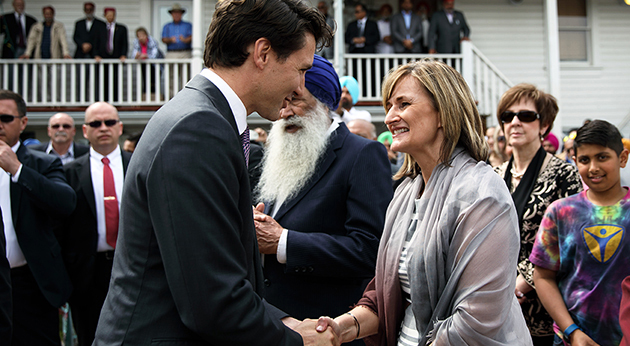 UFV CFO and VP Admin Jackie Hogan was on hand to meet Prime Minister Trudeau when he visited the Gur Sikh Temple in Abbotsford on May 19. A crowd of excited community members spent Friday afternoon waiting patiently for a special visitor on the grounds of the Gur Sikh Temple national historic site on South Fraser Way in Abbotsford. And, at around 1:45 pm, they were rewarded as Prime Minister Justin Trudeau emerged from a private tour inside the gurdwara to give a brief address in the courtyard. He spoke about the importance of multiculturalism in Canada, especially during this year as the nation celebrates 150 years since Confederation. Prime Minister Justin Trudeau tours the (Dis)Enfranchisement exhibit, presented by UFV South Asian Studies Institute, inside the Gur Sikh Temple in Abbotsford with UFV’s Satwinder Bains. May 19, 2017. He noted that it had been one year to the day since his government formally apologized in parliament for the 1914 Komagata Maru incident, which saw a ship of Sikh men (and British subjects) intending to immigrate to Canada denied entry in Vancouver harbour, before being forced out and back to India, where they were shot at by British Indian troops with most men were either killed, injured, imprisoned, or forced into exile. Trudeau added that 2017 is a year to celebrate Canada’s 150th birthday, but also to continue to work on reconciliation and acknowledgement of the injustices suffered by Canada’s Indigenous peoples over several generations. After the speech Trudeau walked through the crowd, shaking hands and posing for selfies with many enthusiastic audience members at the small, invite-only event. 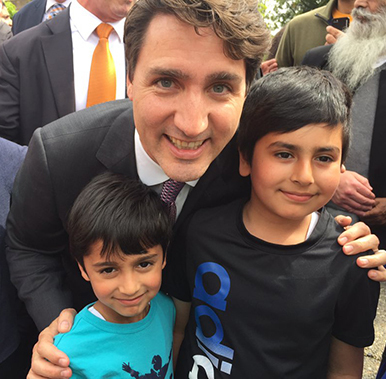 The sons of SASI coordinator Sharanjit Sandhra (Jovin Singh Sandhra and Galvin Singh Sandhra) with PM Trudeau. Satwinder Bains and Sharanjit Sandhra, director and coordinator of the UFV South Asian Studies Insitute (SASI), met with Trudeau inside the temple prior to his speech and toured him through the exhibit (Dis)Enfranchisement 1907-1947: The Forty-Year Struggle for The Vote, which chronicles the 40-year struggle to attain the vote for Indo-Canadians in Canada. The exhibit is funded by a Canada 150 grant from the federal government. The Prime Minister’s visit was a historic moment in the 106-year history of the Gur Sikh Temple as he recognized its Canadian presence as an iconic site of both struggle and success. 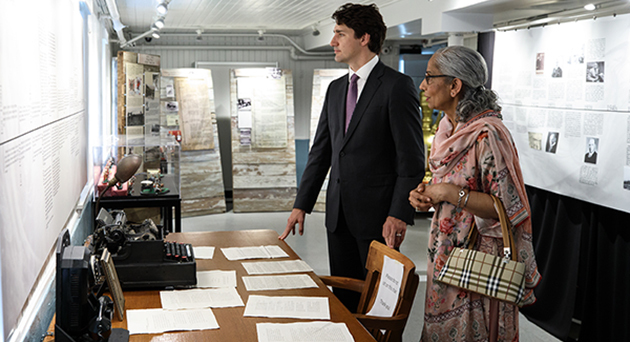 While he toured the exhibit on The Forty-Year Struggle for The Vote, he expressed dismay at the franchise being taken away from early immigrants of many stripes by the governments of the day, according to Satwinder Bains. Other UFV-related community members in attendance included CFO and VP Finance and Administration Jackie Hogan; Abbotsford councillor Kelly Chahal, one of UFV’s Top 40 Alumni; geography instructor Terah Sportel; members of the SASI advisory committee; past and future honorary doctorate recipients (Parm Bains and Andy Sidhu); UFV students; former UFV Board member and federal MP Jati Sidhu; and Alumni Association board director and vice chair Nav Bains. View the Facebook albums here and here. 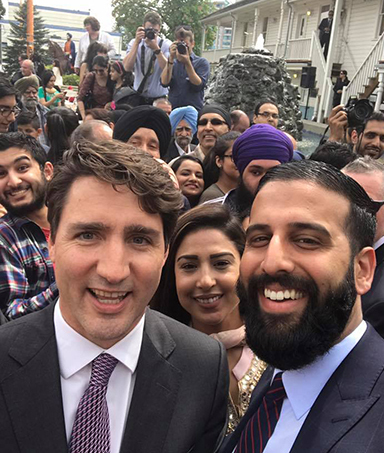 Alumni Association board vice chair Nav Bains with PM Trudeau.